Home Page | Blog | Do you remember finding your first “one ounce” gold nugget? Since the late 90’s I have been metal detecting the Rich Hill/Stanton Goldfields. I always heard of big nuggets from this area, so figured I would give up on some of the other locations such as the Bradshaw’s, Vulture, San Domingo and other districts where I was finding smaller gold. My goal at the time was just to find a one ounce gold nugget, which was not easy to do. I knew guys that had 20-30 years detecting experience, but never found a solid one ouncer. I was determined, so figured I would concentrate where the potential was the highest for larger gold. 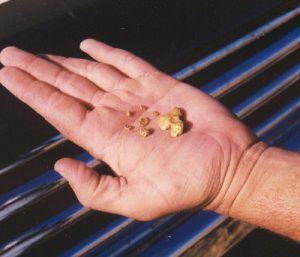 Historically, Rich Hill and the Weaver Mining District was know for large gold nuggets up to Potato size. I seen many pictures in magazines, old reports and such that proved they were there, but not knowing much about the area to start was a challenge. One major advantage I had back then was the price of gold was much lower, so the amount of non-patented mineral claims was minimal. You could practically go most places back then and you wouldn’t see a soul, let alone any mineral claim signs. Places I worked back then that were open to claim are now heavily claimed and off limits. I guess if I knew anything about filing claims and the rising price of gold, I could have locked down a huge portion of that Mountain and probably sold them for a real fortune today. That all being said, I spent many months tromping around digging a few nuggets here and there along with handfuls of trash. I started to second guess if this really was the spot for large gold, maybe most of it was long gone. I had a lot of faith in the detector I was using, which was a Minelab Pulse Induction detector. I knew it had the ability to punch down deep, still find smaller gold to some degree, but the major factor was it’s ability to work in highly mineralized ground. The Rich Hill placers are laced with iron stone, basalts and very mineralized red soils/clays, making it very difficult for a VLF metal detector to work effectively. I guess luck at some point fell into my hands, as I met an older gentleman that had a nugget patch map, which was being passed around for $50. The guy was somewhat struggling, so I worked a deal to make him more maps (photocopies) to waive the $50 he was asking. He agreed, so I got a hold of one of the original $50 Nugget Patch maps for free! The map was still pretty vague as I didn’t know the area real well and I wasn’t the one that discovered the patches. It took me some time wondering around in a few of them to say I really found the true patch location. I did pick up a few pieces of gold in most of the ones I worked. One evening I got a very weak single not far from finding a nugget that was around 2 Dwt’s about 8 inches deep. I dug down a few inches and rechecked the location. The target increased in audio, so I figured it was another nugget around 1-2 Dwt’s. After digging another 6 inches or so, I figured the target was probably out of the hole. I checked the pile of material I removed from the hole, no signal there …. so I rechecked the hole and the signal was booming. After digging down around 14-inches I got the signal out of the hole and it was a beautiful slug of gold! I jumped up in pure excitement, “I DID IT,” my first one ounce gold nugget. I wish someone was there to share the excitement with, but I figured since it was nearly dark I better get the hell out of there. I was trying to guess the weight, but figured it was an easy 1+ ounce gold nugget due to the weight in my hand. One the way home, I was so excited I called just about everyone I knew. I even called my old-time detecting partner, Chris Gholson. I told him I finally got the one ounce gold nugget from Rich Hill. If I remember correctly, I took the piece over to his house not long after the find. We dropped it on the scale and I seen his look …… I said “What?” I knew something was up, and he finally said, “Dude, it’s 19.8 Dwt’s!” You have to be kidding me, all that hard work, excitement and that damn nugget was 0.2 Dwt’s from a true one ounce gold nugget. Chris told me later, you can’t claim you found a one ouncer until you really found a “true one ounce gold nugget.” It was kind of like, you were close Rob, but no cigar for you. I think I lost sleep that night knowing I really thought I had a one ouncer, but I was just shy (just my luck). Well, the moral of the story is to not give up. I set a goal to find a one ouncer, so that was what I was going to do, even if it took me my entire nugget shooting career to do it. Not too much longer, in a spot I found myself, I was finding a bunch of these 1/4, 1/2 and 1 Dwt gold nuggets. I figured it was another “Pennyweight” patch, but finally after digging down about 16-inch I unearthed a nice, solid 1.5 ounce gold nugget. Enjoy nugget shooting, it’s a great hobby. The gold is just a bonus in my opinion. The thrill of finding something, exercise and to clear the mind from stress is what I like about it. You never know, that next target you dig just might be that one ouncer! Wishing you all the best of success. My next goal has been to find a solid, one pound (12 troy ounces) gold nugget. Heck, I know it’s a huge goal to achieve, many never make the one ounce mark. Picture of the first solid, one ounce gold nugget I found. First big one I found was a duzzy! Was waiting for my Brother Bruce and friend Randy to let me hunt their hot spot in Northern Nevada back in the late 80’s. Once there I asked Bruce where he found the big ones!! He and Randy had taken 50 oz or so from this spot with a couple around a pound. All highgraders , so he points me to a hillside. Was swinging a whites back then. Got a good signal right below a ditch and dug a nice nail! Checking my hole still got a decent signal , after digging down another 6 inches I pulled out a rectangular chunk of quartz .You could hardly tell there was gold in it , it looked like silver. I knew what it was almost 8 oz , specific gravity weight was about 5 oz gold. Found another 1 oz piece next day it was quite a trip!! Pays to have Mining buddies! !